Google promised that Chrome would be fast to launch and fast to load web pages, but people predicted it would fail with the arrival of its extensions. 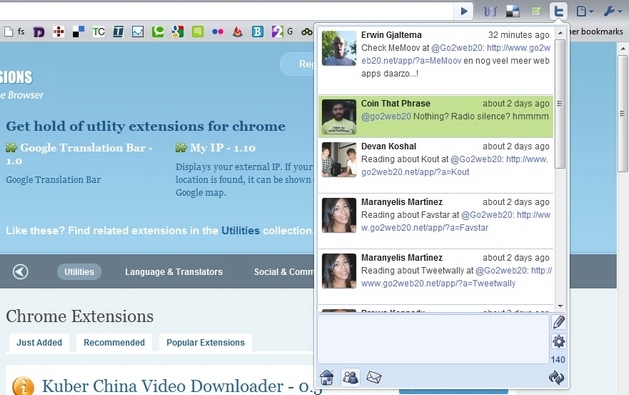 Well, the extensions are here (at least for some of us) and surprisingly they do not affect the browser’s performance. And not only that, but playing with Google Chrome Extensions is like child’s play, whether you’ve added a new extension, or deleted one, you won’t need to restart your browser. Extensions are so easy to manage and use that once you have access to them, I’m sure you’ll be looking forward to testing everything in this Cromeextensions Directory. This is what I basically did. I tried most of the extensions, then realized I’m not ready yet to ditch my beloved Firefox, and I’m guessing that you won’t be either. On the other hand, there are some plugins that are worthy of a mention and from that list I’ve culled some cool ones to get you started. If you already have extensions enabled (lucky you), you are welcome to try the ones in this list. If Chrome is not allowing extensions for you just yet, try to upgrade to the developer’s version (don’t worry, all of your Chrome settings will be saved). I can only assume this list of extensions will grow to overwhelmingly huge dimensions sometime in the near future and then it will be harder to select just a few of them to review. Although the supply is still very small, you can still stream music, or tweet from your browser, and have a list of utilities to start with—you just need to try and see if any of these suit you. And if they don’t for whatever reason, now is the perfect time to go ahead and build something or wait for someone else to build the next big extension. The niches are all ripe to be filled. Soon we will have more extensions than we need. Feel free to share your thoughts about these extensions or recommend other ones.